Innovative packaging for the collective good. Our products are ASTM child-resistant certified, odor resistant, and made from 100% plant-based hemp plastic and 100% reclaimed ocean plastic. We also offer a wide range of custom branding and compliance labeling solutions for our products. The Sana Container is a versatile child-resistant box with optimal space for branding and compliance labeling and a nesting design that allows for efficient shipping and storage. The Sana Container is ideal for flower, concentrates, vaporizer cartridges, and edibles. 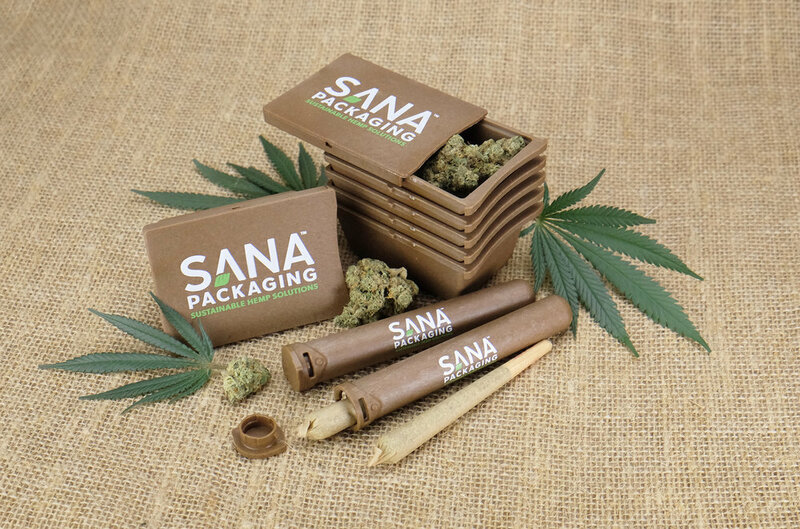 The Sana Container is 27.5 dram and stores up to 3.5 grams of flower with a lid that doubles as a rolling tray. The Sana Container is also ideal child-resistant outer packaging for concentrates, vaporizer cartridges, and edible capsules, mints, and gummies. The Sana Tube is a versatile child-resistant tube that is ideal for pre-rolls, vaporizer cartridges, and vaporizer pens. The Sana Tube is 110mm and fits up to a king size pre-roll, vaporizer cartridges, or a 10cm vaporizer pen. The 110mm Sana Tube is now available in 100% reclaimed ocean plastic! • Customizable hemp paperboard packaging. • Ideal for packaging: edibles, concentrates, vape pens, and more! • Custom pricing on a per-project basis. The 27.5 dram Sana Container and a new 78mm Sana Tube will soon be available in 100% reclaimed ocean plastic! The 78mm Sana Tube is ideal for single vaporizer cartridges and mini pre-rolls. Send us a message for more information about our wholesale and custom packaging solutions. Thank you for reaching out to Sana Packaging! Someone from our team will respond to your inquiry within 1-2 business days.